I was gifted some scraps. These are bright colored scraps and I couldn't just sort them into my regular scraps. They belonged together! I saw the quilt that I fell in love with right away at Katy Quilts called Twist. I knew instantly what I would do with the scraps. Many of them were already sewn into strip sets. Yep... I tore them apart. I was left with many happy 2.5" strips! I pulled out the reds and made a couple twist blocks. I decided that all of these brights in these gifted scraps need to stay together in a quilt. I'll be making twist blocks for a while. I'm linking up with Angela at SoScrappy for the RSC16 here. I know it's called slow stitching for a reason, but I wasn't aware that I made so much progress on this block (at least I think so) since my last post. Here it is now with all but the branch on the write slow stitched down! Whohoo! Linking up at Kathy's Quilts. here. to join in on the fun for A New WIPs Be Gone. You can't tell how soft it is, but I actually backed it with soft fleece. Yes, it was a stretchy fabric, but it worked perfectly for this quilt. It's so soft. It didn't get out of shape or anything! In April/May 2016 our guild started a project bag program for charity quilts. Here's how this quilt was made: In May Sue donated a bunch of orphan blocks and quilt pieces to be made into charity quilts. At the July business meeting Sandy picked up one of the charity project bags that just had some flying geese blocks in it. She took it home and assembled this adorable charity crib quilt top. She brought the quilt top back to the August meeting. Kathy picked up the quilt top and put it with a piece of soft fleece fabric for backing donated by JoAnne. It was quilted with the Egyptian Eye pattern. Sandy volunteered to put the binding on this quilt. That's how charity quilts are made. Today I played with some scraps in the bin close to my sewing machine. I made a couple cute butterfly blocks. I found the tutorial at SewCanShe blog. The butterfly tutorial and linky party is here. For September I would like to complete this charity quilt for our local quilt guild. This quilt needs a back made, quilted, and bound. 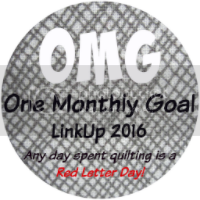 It's time to link up for the September OMG LinkUp at Red Letter Quilts. Do I have time for a new QAL before Thanksgiving when Bonnie Hunter's big mystery starts? I doubt it. But this one is too tempting to pass. I was especially excited when I saw Sharon's scrappy browns yesterday on her blog, Vrooman's Quilts. I'm in too, following Sharon's lead. Then to my surprise -- or not -- I get a text from my quilting bestie, Julianne at Quilting with Calicos telling me to check out her blog post yesterday. SHE is doing this QAL too. AND BETTER YET, her friend, Julie, is too! It's official -- I'M IN! Here's a picture of my tub of browns. I'm thinking about going with red centers for the blocks and green sashing (or grey sashing, or red sashing). Of course I'm going to have to go big on this one. Those paw prints on the border are way to cute to leave out. Then I stirred the bin a little and you can see more fun browns. I'm linking my fabrics up to the linky party at Sew Fresh Quilts here. 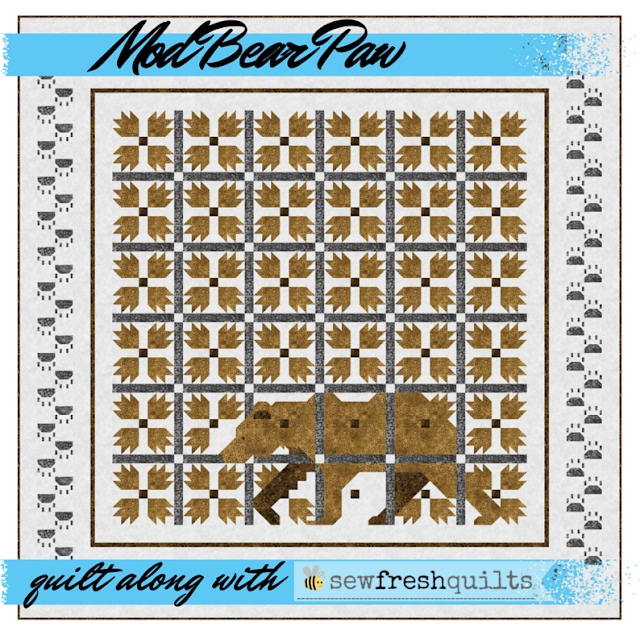 The picture below is from Lorna's blog post on Sew Fresh Quilts. I even have a giant Circle Lord board (Egyptian Eye) that has similar quilting. All I need to find is a big chunk of white fabric... I'm sure there's one in my stash somewhere. I am working on the Welcome Home Sampler Quilt in the book Welcome Home ~~ Surround Yourself with Country Warmth, by Cheryl Wall. Another cute charity quilt is on my longarm right now. The fun block in this quilt is called the Railroad block. It is made with two 4-patches and two half square triangles. I am quilting the quilt with a giant template board for Circle Lord called Egyptian Eye.